This weekend, I get to travel to Fort Washington, Pennsylvania to visit the headquarters of CLC USA, the publishers of Resisting Gossip. I'm excited about this trip because CLC is celebrating their 75th anniversary as a mission with a special conference, and they've asked me to speak about how BIG our God is. I am eagerly anticipating our time together at your upcoming annual conference. As a CLC author and friend of the ministry, I am excited to share God’s Word with you as you celebrate your 75th anniversary. The theme for your historic conference is “Our Big God,” and Dave Almack asked me to send some Scriptures on this theme to reflect upon as we prepare our hearts for our time together. I suggest spending some extended time contemplating Isaiah 40 before the conference. Few chapters in the Bible can match Isaiah 40 in their depictions of the greatness and grandeur of our Lord. Isaiah both comforts and challenges his readers to place their hope in this great big God. 1. What came before this chapter in Isaiah’s prophecy? Why did the people of Israel need the comfort of Isaiah 40? 2. What are the word pictures Isaiah uses to describe the coming of the Lord? How do they encourage God’s people to hope in Him? When and how will these prophecies be fulfilled? 3. In verse 6-8, we are reminded of our transitoriness in contrast to the enduring power of God’s Word. What are some of the implications and applications of this truth to our lives today? How does it chasten and also encourage us? 4. Reflect on the concurrent character of the God who is coming, simultaneously both a powerful king and gentle shepherd (vv.9-11). How does that make you feel? In what ways does it help you to hope in Him? 5. Why does Isaiah shift gears in verses 12-26? How does he challenge the people of God in the second part of the chapter to believe in the comfort that was promised in the first part? 6. Think about each of the word pictures that Isaiah uses to illustrate the incomparable awesomeness of the LORD. How does each one convey how big, smart, tough, and worthy He is? How does this lead you to worship? What do you wish you understood better or saw clearer about Who God is? 7. Why do you think the last paragraph of this prophecy includes a gentle rebuke (vv.27-28)? Do you need to hear that yourself right now? Why? 8. The upshot of this whole chapter is a call to hope in the Lord, to wait on Him. “To wait” is to live out a “resolute, expectant longing.” What might that look like in your life? 9. When we hope in the Lord in this way, He gives us the strength to go on (vv.28-31). This strength is supernatural and often surprising. How have you experienced this in the past? In what ways do you need it today? Spend some time asking God for a vision of His greatness and the hope to keep trusting and waiting on Him. Follow this link to listen to a sermon I preached on Isaiah 40 on my 15th anniversary as pastor of Lanse Free Church. Or you can read the manuscript of that message here. May the Lord bless you as you prepare your hearts for the conference. 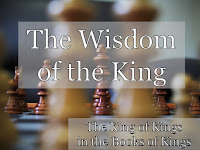 [Matt's Messages] "The Wisdom of the King"
Last week, we started our new sermon series called, “The King of Kings in the Books of Kings” and we looked the rise of King Solomon in chapters 1 and 2. Solomon became king of Israel after David. There was a bit of a political intrigue and potential coup, but Solomon rose above it and was crowned king, sat on the throne, received David’s instructions on what a good king would do and then shrewdly secured his throne after David died. According to David, a king of Israel has just one job: walk with the one true God leading others to do so too. There are other duties, of course, but whether or not you are a thumbs-up king or a thumbs-down king boil down to that one central job. Keep the covenant and lead Israel to do it, as well. So what kind of a king will Solomon be? In many ways, Solomon is a two-thumbs-up king. We’re going to see that this morning. He had an amazing rule and reign! But at the risk of spoiling the story to come, Solomon also turned out to be a huge disappointment. And I think we can a learn a lot by looking closely at his life. Because, as we’ll see, Solomon is absolutely famous for his wisdom. We’re going to see how he got, how he used it, and what difference it made for his kingdom. But chapter 3 begins with Solomon doing something that I think is decidedly un-wise. Chapter 3, verse 1. Now, that verse tells you a lot, but it’s pretty surprising, isn’t it? Solomon is going to build an amazing palace and an amazing temple. We’re going to learn about those amazing building projects the next time I get to preach here. And he’s going to bring his new bride to live in the City of David until those building projects are done. And his new bride reflects how important a figure he has become as the king of Israel in the middle East. He marries Pharaoh’s daughter. Yes, that Pharaoh. As in, the king of Egypt. Now, I don’t think he was supposed to do that. I seriously doubt that “Pharaohina” had converted to worshiping the LORD. It seems to be a mostly political marriage. An alliance with Pharaoh which would bring Solomon prestige and power on the world stage. But I don’t think it was probably a wise move. And we’ll see how that plays out in Solomon’s life by the time we get to chapter 11. I’m sure that other people in the Old Testament loved the Lord. One of the psalmists says it of himself. He walked “according to the statutes of his father David.” He did what David said in chapter 2! Now, at this point in his life, he’s doing that worship to the LORD, to the one true God. The God of Abraham, Isaac, and Jacob. To the Great I Am. Yahweh. And it’s kind of excusable that he did it at the high places because verse 2 says there wasn’t a temple yet. Okay. Just stop there for a second and truthfully answer that question for yourself. Blank check from God. What do you put in there? What you ask for at that moment says a lot about who you really are. Of course, this is also says even more about who God is. Doesn’t it? The LORD is a generous God. He loves to give good gifts to His children. Who took the initiative here? Did you notice that? God comes to Solomon and not the other way around. “Solomon answered, ‘You have shown great kindness [hesed] to your servant, my father David, because he was faithful to you and righteous and upright in heart. You have continued this great kindness [hesed, covenant loyalty] to him and have given him a son to sit on his throne this very day. Do you see how humble Solomon is? He calls himself a “little child” though he’s already a man married to Pharaoh’s daughter. And the work of being the king, in charge of all Israel, caring for and shepherding Israel is too big a job for him. He needs help. He needs...wisdom. And verse 10 is the most amazing verse. Good job, Solomon! That’s the right heart. That’s the right thing to ask for. The wisdom of the king. Here’s point number one of three. It’s so obvious, but we can so often miss it. #1. WISDOM IS A GIFT FROM GOD. Sometimes, we talk about the “wisdom of Solomon” as if it was something he came up with on his own. He did good to ask for it, but Kings stresses that his wisdom was a gracious gift from a generous God. If God didn’t give it, he wouldn’t have it. On his own, Solomon was needy. He was in over his head. He was going to get buried by this task of ruling Israel. And he knew it. So he asked! Do you ask for wisdom from God? You and I may not be the Kings of Israel, but we have the same God that Solomon did. A generous God who loves to hand out wisdom. Liberally. Bounteously. Freely. I think that I am asking for wisdom in prayer more now that I ever have been in my life. I, so often, just don’t know what to do. As a husband, a father, a leader in the church. I feel like I should know a lot more, that I should know a lot more of what I should I do. You know that’s what wisdom is, right? Wisdom is skill in living rightly. Not just a good thing but a right thing, a righteous thing. One of the reasons why I love that song we sing, W-I-S-D-O-M is not just that we get to yell in church. It’s that we sing a declaration of our neediness. Have you ever been asked if you have any prayer requests and you’ve answered, “I think I’m good!” I sure have. Solomon humbled himself. Called himself a child. The king of all Israel admitted that he was simple and foolish on his own. And it became his number one prayer request. Because wisdom is a gift from God. When I was a child, our family Bible had a colorful picture of this tragic story in it. It always stood out to me. Solomon has a hard choice to make. Which one of these ladies of the night is the true mother of this child? So they brought a sword for the king. Wisdom is a gift from God. If you have it, then thank God for it. I you don’t, then ask God for it. Here wisdom restore a child to its rightful mother. It also brings awe among the nation. In chapter 4, Solomon’s wisdom (which is a gift) brings blessing on his entire kingdom. Verse 1. Here’s his royal cabinet. And the point of the names is that Solomon knew whom to put where. Surprisingly verse 4 says that Abiathar still was a priest, on the same level again as Zadok. Perhaps that’s grace and mercy or maybe it’s just his official position on the list. Either way, it’s wisdom. Solomon knows what he’s doing. He’s ruling in the wisdom. These were the right guys in the right places to govern wisely. These guys were collecting the taxes and everybody was happy. Can you imagine? Verses 7-19 tell us who was collecting the taxes, and verse 20 says that everybody was happy! It’s a fulfillment of the Abrahamic Covenant, isn’t it? Whenever you hear those words “as the sand on the seashore” in your Bible, your mind should go directly back to Genesis. God always keeps His promises, right? But it’s also an answer to Solomon’s prayer for wisdom. If you know the right things to do and do it, then you will experience a measure of blessing. Even in our broken world where things don’t always work the way they should (read the book of Job, read Psalm 73, read Ecclesiastes, even in our broken world) when you live out God’s wisdom, you and the people connected to you experience God’s blessing. Or another way of saying it is that wisdom works. “Solomon's daily provisions were thirty cors of fine flour and sixty cors of meal, ten head of stall-fed cattle, twenty of pasture-fed cattle and a hundred sheep and goats, as well as deer, gazelles, roebucks and choice fowl. For he ruled over all the kingdoms west of the River [that’s the Euphrates! ], from Tiphsah to Gaza, and had peace on all sides. That’s the land promise of the Abrahamic Covenant fulfilled like never before! And really, never yet since! Think about what we learned in Genesis about the promise of Land to Abraham. How long has it taken for that land to finally come to Abraham’s children? And it’s all the blessing of wisdom. These are blessings Moses talked about in Deuteronomy 27 and 28. There are few things more valuable in life than wisdom, but what we do? We spurn it. We run from it. We devalue it. It content ourselves with ignorance and foolishness. We don’t dig for it like we’re digging for gold. “God gave Solomon wisdom and very great insight, and a breadth of understanding as measureless as the sand on the seashore. Solomon's wisdom was greater than the wisdom of all the men of the East, and greater than all the wisdom of Egypt. He was wiser than any other man, including Ethan the Ezrahite (who wrote psalm 89)–wiser than Heman (who wrote psalm 88), Calcol and Darda, the sons of Mahol. And his fame spread to all the surrounding nations. And he’s going to use his wisdom to build some amazing buildings, too. Wisdom is a gift from God. Verse 29 said it again. And wisdom brings blessing. The blessings here of prosperity, safety, popularity, fame and flourishing. Of course, not all of the blessings of wisdom will be temporal and earthly like that. Many of the most important blessings are spiritual and heavenly and even greater. But these are illustrations of what God can do when we pray for and practice the wisdom that He so graciously sends. Sometimes I wish the story ended here. We have offspring, land, and blessing. It almost seems like the Abrahamic covenant has been fully fulfilled and the kingdom has come in all of its fullness. But actually, this kingdom has cracks. As good as it is, it’s not as good as it can get. And it’s not all that it’s cracked up to be. And that’s because there are cracks in the king. As much as it seems like Solomon was just about the Messiah–and I think he’s a true picture of Him!–Solomon was definitely not the Messiah. Did you catch it verse 26 and verse 28? Probably not because I didn’t point it out. And I’ve never preached Deuteronomy 17. You might not know what’s in there. But there was something off about those verses, too. Hmmm. And the very next verse in Deuteronomy says one more thing that the King should not accumulate very many of. Anybody know? He’s good right now. But there’s storm clouds brewing on the horizon. Solomon is not the Messiah. Solomon is not the Christ. #3. WISDOM IS HIDDEN IN JESUS. As wise as Solomon was, Jesus is so much more. Jesus is the treasure chest of wisdom. Solomon was just a shadow of the One to come. Jesus is the King of Kings with all of the true Wisdom of the King hidden within Him. If you want wisdom, then what you really want is Jesus Christ. He will never go sour on you. He will never repeat the mistakes of the kings of Israel. And if you pursue Him, you will find all of the wisdom that you need for life and godliness. Wisdom is hidden in King Jesus. [Matt's Messages] "Who Will Be King?" My plan is for us to study both First and Second Kings over the next....I don’t know how many weeks! I thought Romans could be done in a year, so I don’t want to predict how long it might take us to get through these two Old Testament books together. But it will be a while. There is a lot of ground to cover in these two books. Now, most scholars believe that they used to be one big book, but at some point they got divided into two to make it easier to find things in them. So, we use the designation “First Kings” and “Second Kings,” but it’s really one long continuous story. I say, “long,” but I realized during my study this week that for all that the author leaves in about the history of the kings of Israel, he leaves a lot more out. Anyone want to guess how many years this big book covers? It’s about 400 years. From King David to King Jehoiachin. And the author covers that history (of two different monarchies!) in just around 50,000 words or 47 chapters of scripture. Do you know how old our country is? The USA? If you count from 1776, it’s 240 years old. How would you like to write the history of the United States of America in only 50,000 words? And this is about twice that many years. So the author had to leave a lot of things out. But he gets all of the most important things in. The Holy Spirit made sure that he did. And all of the most important things tell us something important about God. The Books of Kings are not just history books. They contain history, but they are revelatory books. They reveal God. What we are going to read in Kings is theological history. It’s history that tells us the story of God so that we know Who God Is, What God Has Done, and What God wants for us and from us. Does that sound familiar? It’s the outline from last week. It’s something that runs throughout the Bible. As we read the Books of Kings, we can’t get lost in the history. We’ve got delve into the history to get a better picture of our Lord. Because God is the main character of the story. For those of you who have been with us for the last dozen or so years that shouldn’t come as a surprise. We’ve learned before that the Lord is the main character of the story. This is the next book in our multi-decade series of series on the Big Story of the Bible. In 2003, we studied the book of Genesis. Anybody remember that? In 2005, we did Exodus. In 2007, we did Numbers. Life in the Wilderness. In 2009, we did Joshua. Possessing the Promises. In 2012, we made it to Judges. The Downward Spiral. And also the book of Ruth. In 2013 and 2014, we met King David in the books of Samuel. A heart for the heart of God. The Lord is My Rock. And now we’ve reached the books of kings. And we’ve seen all along that it’s not Adam, Abraham, Issac, Jacob, Joseph, Moses, Joshua, or David who is the main character of this story. Our God, Yahweh, the LORD is the main character of the story. Now, there are going to be a lot of characters to meet in these 47 chapters. There are so many prophets, priests, and kings with really strange and hard to pronounce names that it will be very difficult to keep track of all of the people that we meet. But if we keep our eyes on the main character, the Great King of all Kings, we’re going to get the most important part of the story. But instead of introducing our series any more, I just want to dive in and get this story started. Because the sooner we do, the sooner we know our God better. That’s actually a question that comes up a lot in these two books, as you might imagine. But it’s the big question that confronts the nation of Israel as this book begins. There is a king in Israel. He’s not the first king. That was Saul. But he is the first king whom God had truly wanted the people of Israel to have. What is his name? King David. That’s right. Do you remember all that we learned about him in 2013 and 2014? Well, King David has not gotten old. And not just old but “old and cold.” In fact, he’s getting very weak and apparently dying. 1 Kings chapter 1, verse 1. Now, why is this story in the Bible? Well, for one, because it happened. There are a lot of stories in the Bible that I’d rather not know about including this one about a human-hot-water bottle named Abishag. But it really did happen for better or worse and the Bible doesn’t sugar coat the history of our heroes of the faith. But there are a couple of other reasons why it’s in here. One is because this beautiful young lady, Abishag, is going to come up again in the story real soon and play a part in the downfall of a potential king. But the other reason is that we need to know in no uncertain terms that David is really old, really weak, and just about dead. And here’s the scary part, it’s not clear right now who his successor is going to be. “Now Adonijah, whose mother was Haggith, put himself forward and said, ‘I will be king.’ So he got chariots and horses ready, with fifty men to run ahead of him. (His father had never interfered with him by asking, ‘Why do you behave as you do?’ He was also very handsome and was born next after Absalom. )” Stop there for a second. Is Adonijah going to be king? It certainly looks like it. He’s got the stuff. He’s got the entourage. He’s got the ambition. We’ll see in a second that he’s got the connections. And he’s apparently the oldest living son of David. The others have all died. We’re not sure how Kileah died, but we know how Amnon died and Absalom. This son sounds a lot like Absalom doesn’t he? Anything else he sounds like? He sounds like Saul, too. Doesn’t he? I wouldn’t be surprised to find out that he was tall. This guy looks really good on paper. Adonijah looks really good on the outside. But what question does that raise? What does he look like on the inside? Let’s not forget that life lesson. It’s so easy to judge other people by appearances. In choosing a spouse for example. Guys want a looker. Ladies want a hunk. And, there is nothing wrong with beauty. I happen to have found the most beautiful woman on the planet and tricked her into marrying me. But if she wasn’t beautiful on the inside, too, I’d be in big trouble. Or in choosing a leader or a employee. Who looks the best on paper, who has the most gifting, the most popularity, the most clout? Don’t forget to find out what’s on the inside. What do they care about? What do they worship? To whom or what are they loyal? Don’t forget that God looks on the heart. And especially remember it when it comes to you and me. We can look good on the outside and be a total mess on the inside. Remember what we said at the Good News Cruise? It’s what’s under the hood that counts. What’s going on under your hood? Are you allowing God to work on you? And give you the engine overhaul that you need? “Adonijah conferred with Joab son of Zeruiah and with Abiathar the priest, and they gave him their support. [Those are some familiar names there from David’s early history as king.] But Zadok the priest, Benaiah son of Jehoiada, Nathan the prophet, Shimei and Rei and David's special guard did not join Adonijah. This is what we call a “coup.” Adonijah is taking the reigns of power to himself. And it looks like most of the key leaders are with him. But the LORD has other plans. Did you notice that there was brother that he didn’t invite to the royal party? Solomon. And that probably means that most people knew that Solomon was supposed to be king but David had apparently never made it official. Not enough, at least. But he’s also apparently too weak to do it now. “Then Nathan [remember him? He’s a a truth teller! Nathan...] asked Bathsheba, Solomon's mother [remember her? ], ‘Have you not heard that Adonijah, the son of Haggith, has become king without our lord David's knowing it? She said to him, ‘My lord, you yourself swore to me your servant by the LORD your God: 'Solomon your son shall be king after me, and he will sit on my throne.' But now Adonijah has become king, and you, my lord the king, do not know about it. He has sacrificed great numbers of cattle, fattened calves, and sheep, and has invited all the king's sons, Abiathar the priest and Joab the commander of the army, but he has not invited Solomon your servant. I love that party of the story! Everybody found somewhere else to be. Slink, slink, slink. That was the Lord’s plan all along. The question is, will he be a good one or a bad one? As we go together through the Books of Kings, we’re going ask this question over and over again. Was this particular king a thumbs up generally or a thumbs down? Now, I’ll tell you secret right up front. They all have some bad in them. Every single one. Look at King David. He was the standard. A man after God’s own heart. A thumbs up. But he’s failed in so many ways. He failed back in 1st and (especially) 2nd Samuel, but he’s not done perfectly already in this book. Verse 6 told us that Adonijah’s arrogance and pride were at least partially David’s fault. He’s left a lot of things undone. Up till now, he’s not made Solomon’s future as king secure. And he’s about to die with some business unfinished. But he was, on the whole, a good king. A great king, really. A thumbs up. And that’s because he did the one thing that every one of God’s kings must do. He walked with God and led Israel to keep the covenant with God. You see, that’s what the Lord judges as success in a king for Israel. Not whether or not the king leads his armies to victory or whether or not the king brings economic prosperity to the kingdom or whether or not the king establishes peaceful treaties with the nations around them. The one big question that the Lord cares about is whether or not the king walks with God, worships the Lord alone, and leads the people of God to do the same. That’s what are going to see again and again and again and again as we go through this book together. It’s how the kings are evaluated. And it’s what David tells Solomon to do in chapter 2. These are David’s dying instructions to Solomon as he becomes king not just co-regent with David but king on his own. Chapter 2, verse 1. “When the time drew near for David to die, he gave a charge to Solomon his son. ‘I am about to go the way of all the earth,’ he said. There is the thesis statement for our whole sermon series. Walk with God and lead Israel to do it, too. There is this thing called the covenant. Your job as king is to know it and lead Israel to keep it. I’ll prosper you. I’ll give you blessings. And I’ll keep a Davidic king on the throne. V.3 “...so that you may prosper in all you do and wherever you go, and that the LORD may keep his promise to me: [2 Samuel 7] 'If your descendants watch how they live, and if they walk faithfully before me with all their heart and soul, you will never fail to have a man on the throne of Israel.'" Solomon, you have just one job. Now, church, we are not Solomon. We are not the king of Israel. But I think we could probably apply this to ourselves as well. Do we walk with God and lead others to do it, too? It’s not about how successful we are at our business. It’s not about how beautiful our houses are. It’s not about how many cars we have. It’s not even about how big or happy our families are. Or how healthy we are. Or how smart or popular or funny. It’s about do we walk with God and lead others to do so, too? Now, what if you don’t? What if you turn out to be a thumbs-down kind of person? We know that with obedience comes blessing. But we also need to know that with disobedience comes danger. The kings that fail at their one job will lose their job. There are consequences for failing to keep the covenant. And yet there is also grace. God’s people don’t always get what they deserve. And God always keeps His promises. Even to people who don’t deserve it. There is no karma in the books of Kings. There is justice. And there is grace. And they are both found in our Lord. Which is good. Because we need them both. In verse 5, David’s instructions turn personal and political. He lays out some unfinished business that he wants Solomon to finish for him. Do you remember all that from 2 Samuel? General Joab and his murders of Abner and Amasa? David had let Joab live. And even stay the leader of the army. But that doesn’t mean that he’d forgotten. And Joab had gone with Adonijah not Solomon in chapter 1. So, he needed to neutralized. Now, is this personal vendetta, political maneuvering, or godly execution of justice? I’m not sure. My guess is that it’s a little of all three. Life is messy. And so is King David. He’s not perfect. He doesn’t have a halo. “‘But show kindness [hesed, covenant loyalty] to the sons of Barzillai of Gilead and let them be among those who eat at your table. They stood by me when I fled from your brother Absalom. That’s the first successful transfer of power in the Davidic Dynasty. We’re going to read a lot of statements like verse 10 and 11 as we go through Kings. So and so rested with his fathers and had reigned so many years. That formula reminds us how short our lives are and how important it is to make them count. What are you doing with your years? The rest of the chapter just explains how Solomon’s rule was firmly established. “Now Adonijah, the son of Haggith, went to Bathsheba, Solomon's mother. Bathsheba asked him, ‘Do you come peacefully?’ He answered, ‘Yes, peacefully.’ Then he added, ‘I have something to say to you.’ ‘You may say it,’ she replied. ‘As you know,’ he said, ‘the kingdom was mine. All Israel looked to me as their king. But things changed, and the kingdom has gone to my brother; for it has come to him from the LORD. [It’s good that he recognizes that.] Now I have one request to make of you. Do not refuse me.’ ‘You may make it,’ she said. When Bathsheba went to King Solomon to speak to him for Adonijah, the king stood up to meet her, bowed down to her and sat down on his throne. [Wow! That’s honor.] He had a throne brought for the king's mother, and she sat down at his right hand. So Benaiah son of Jehoiada went up and struck down Joab and killed him, and he was buried on his own land in the desert. The king put Benaiah son of Jehoiada over the army in Joab's position and replaced Abiathar with Zadok the priest. Shimei answered the king, ‘What you say is good. Your servant will do as my lord the king has said.’ [He knows that he is in trouble and promises to keep his nose clean.] And Shimei stayed in Jerusalem for a long time. But three years later, two of Shimei's slaves ran off to Achish son of Maacah, king of Gath, and Shimei was told, ‘Your slaves are in Gath.’ At this, he saddled his donkey and went to Achish at Gath in search of his slaves. So Shimei went away and brought the slaves back from Gath. Solomon. And we’ll learn more over the next few weeks what kind of a king he was. But I’ll tell you what kind of a king all of these guys are. I’ll give you a glimpse into the whole rest of this series. It’s not as depressing as the book of Judges was, but almost. Because there is, if not a downward spiral, a downward slide. And every single king, every single anointed one, is disappointing on some level. Even the best of the best who are two thumbs up in general are nothing like they really should be. You know I wanted to really be proud of David or Solomon in these first two chapters. And I think overall they do well. But it’s messy, isn’t it? David disappoints, and if hasn’t already, Solomon will. I promise you. And they all die. Every single one of them. There is no perfect king in these books. It means that each one of them points to the king of kings that we all so desperately need. Every king that we will read about will show us how desperately we need the king of kings. Because every one of them will disappoint us, but Jesus will not. Because, as we learned last week, Jesus has come back from the dead. “Brothers, I can tell you confidently that the patriarch David died and was buried, and his tomb is here to this day.” [1 Kings 2:10 tells us that.] But [King David was also] a prophet and knew that God had promised him on oath that he would place one of his descendants on his throne. And when they heard that, about 3,000 people got saved! Jesus Christ who has risen from the dead. 1. 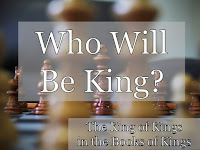 Are you looking forward to this new sermon series on the Books of Kings? Why or why not? 2. 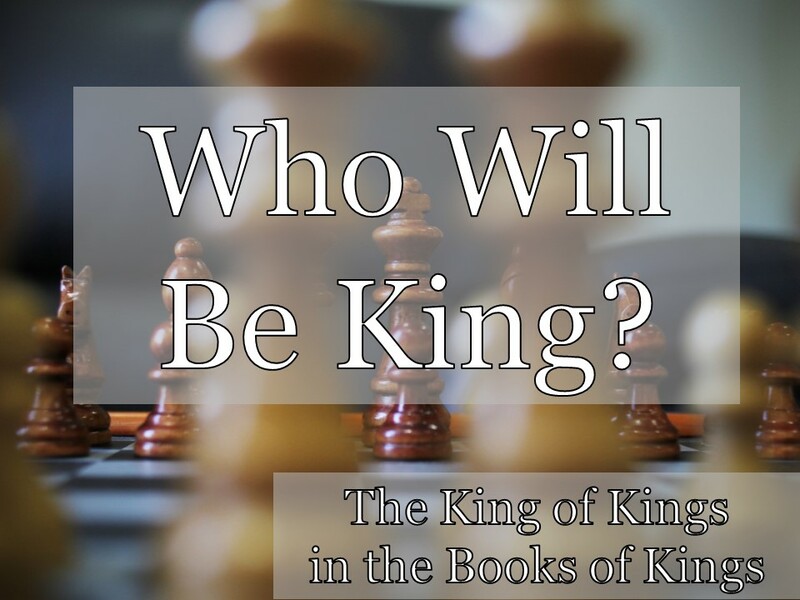 Why is it important to remember that God is the main character in the books of Kings? Why might that be hard to do? What other things about the books of Kings make it difficult to read, interpret, and study? 3. Review 1 Kings 1 and discuss Adonijah’s bid for the throne. Why did it look like he might be the next king? What went wrong (hint: remember 1 Samuel 16:7)? What can we learn from this for our own lives? 4. Review 1 Kings 2 and discuss the establishment of Solomon’s kingship. 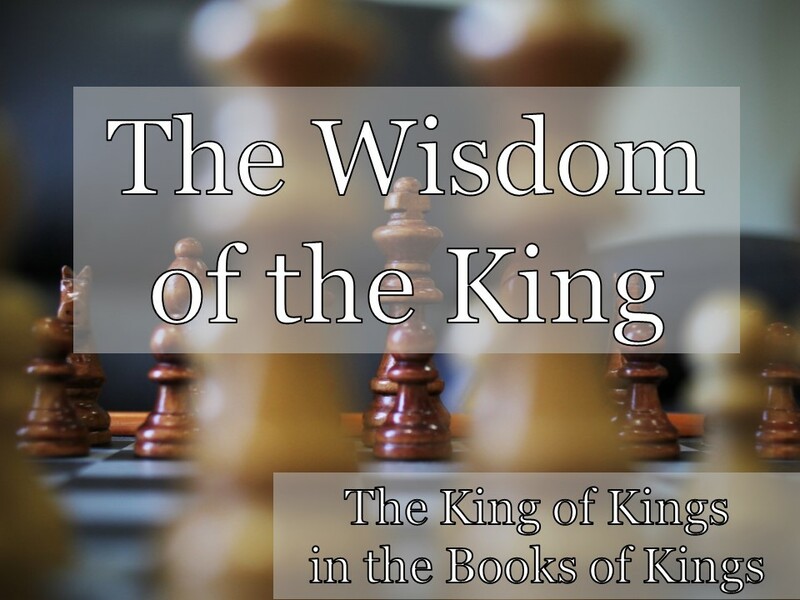 What is the king’s “one job?” What can we learn from this as believers today? 5. In what ways are all of these kings disappointing? How does this point to our need for the King of Kings? What are ways that you can express your love, trust, and loyalty to Him this coming week?